Another trek to an Asian grocery, one that’s a little closer, brought this delightful…thing. Swagger and I found this while stopping for a cool drink on a muggy day. There were a few flavors there, the standard orange and strawberry, but this looked intriguing. It was the only flavor where no english was present, so I was excited to have a drink. The package was bright and green and featured many photos of tropical fruits, leading me to believe that maybe this was a tropical fruit, maybe a punch flavor. WRONG. When I opened the can- and it has that special can shape, that slightly more triangular shape of opening. Do you know what I mean? That one. Well, when I opened the can, I was hit with a strong flavor of bubble gum. Strange. And when I tasted it, that was all I tasted. Bubble gum. It was as though someone had taken eighty five Bazooka Joes, thrown out the comics, and melted them down to make this soda. 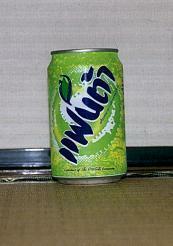 It was the same green color as the can, oddly enough, and threw me off for the flavor. There might have been hints of tropical fruit flavor, but there’s a chance I’m making that up because I’m confused.